Your Instructions are to WALK ON THE WATER – Immediately! “Immediately He directed the disciples…” My antennae shot up. I knew that God was getting ready to give directions to us, His disciples. My next thought was, “Immediately after what?” Immediately after feeding the five-thousand Jesus gave these instructions to the disciples. This means that immediately following this miracle, He instructed the disciples to get into a boat and head across the Sea of Galilee. That shows how urgent these instructions truly were. There was no gap or delay between the two. Time was of the essence then, just as it is now! The word ‘immediately’ is in the KJV eighty times – forty times in the book of Mark alone! So, out of forty times in the entire remainder of the bible, the Lord uses it three times here. That’s important! These instructions need to be followed immediately! This is an IMMEDIATELY season! 22 Immediately He directed the disciples to get into the boat and go ahead of Him to the other side [of the Sea of Galilee], while He sent the crowds away. 23 After He had dismissed the crowds, He went up on the mountain by Himself to pray. When it was evening, He was there alone. 24 But the boat [by this time] was already a long distance from land, tossed and battered by the waves; for the wind was against them. 25 And in the fourth watch of the night (3:00-6:00 a.m.) Jesus came to them, walking on the sea. 26 When the disciples saw Him walking on the sea, they were terrified, and said, “It is a ghost!” And they cried out in fear. Listen, family! The Lord would have you know today that you are getting ready to have a WATER WALKING EXPERIENCE! God wants you to walk where you have never gone before, even as He tells you, “Do not be afraid!” He repeatedly says in His Word, DO NOT BE AFRAID! BE COURAGEOUS! Be strong and very courageous, (see Joshua 1:7, 9)! He means it, so listen to Him. “Peter replied to Him, “Lord, if it is [really] You…” (v. 28). Peter knew that it was him! He had read Exodus 3:14; had read the Torah, and knew the Scripture. He had been walking with Jesus for around two years already, and knew him. Yet, Peter still said to Him, “Lord, if it is REALLY You…” This means that even if you have been walking with the Lord for some time, you may still have opportunity to stop and say, “REALLY, God? Is that You?” So, don’t beat yourself up! He is doing a new thing! You have never walked on this water before! “Peter replied to Him, “Lord, if it is [really] You, command me to come to You on the water.” 29 He said, “Come!” So Peter got out of the boat, and walked on the water and came toward Jesus,” (vv. 28-29). Ask for and expect instructions from God immediately. Don’t be afraid to ask God to “command you” to do things that you see Him doing. If you have it in your heart that you are called to something, ask the Lord to “command” you to walk in it. Increase your expectation! 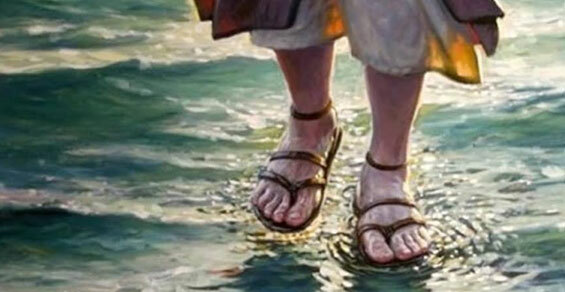 Once you ask Him to command you to walk on the water, expect it to happen! IMMEDIATE COURAGE: “But immediately He spoke to them, saying, “Take courage, it is I! Do not be afraid!” (v. 27). Once He commands you to do it, don’t be afraid. Just listen to His voice! Peter was not afraid to do what God commanded Him to do. He just stepped right out of the boat and started walking on the water. He did it, and so can you! Don’t look down, don’t look at the waves, and don’t be afraid. Expect the God that created the universe to immediately give you the courage that you need to walk on the water…just listen to what He says. IMMEDIATE ASSISTANCE: “Immediately Jesus extended His hand and caught him,” (v 31). Once you are walking on the water, expect God’s help to come when you need it, and don’t stop walking, no matter what! Don’t let the enemy win! Keep walking on the water! Peter should have kept going. He stopped just short of his miracle. Don’t do that! Expect the divine, supernatural hand of God to be extended to you in immediate assistance! Once you have walked on the water, you can never go back to an ordinary existence! God wants to take you so much further than you have ever gone before, further than you ever even thought was possible…in fact, God wants to take you beyond the impossible! Yield to Him in this season of immediately. Believe in Him. Trust Him to hold you up as you walk on the waves! Be blessed in your season of immediately! 2-4PM FREE Class! Learn to WRITE, PUBLISH and SELL your book! Previous Previous post: Loose your Donkey! It’s a New Thing! Next Next post: WISDOM HAS ARRIVED!